The Airone Trikes are very unique PPG Trikes that are designed with attention to detail and are universal to fit most paramotors on the market. The Airone PPG Trikes are very lightweight yet feature a strong construction that it fold down into some of the smallest units on the market in just a few seconds. The rear axles pull out and the rear wheels also remove from the axles and then the chassis of the Airone SOLID Trike folds in half making it very small and compact for transportation. The SOLID a very unique feature in that you can drop the front wheel and forward chassis strut which has a quick release designed into the construction so that you can release it in-flight so the front wheel hangs below the trike and this enables you to still use the paraglider SPEED BAR in-flight. With a flick of your foot the front wheel comes back up and automatically locks in position for landing or if you want to just put your feet up onto the steering foot pegs for in-flight leg comfort. The wheels are purpose made, light weight Spoked wheels that look like BMX wheels but are very strong to take the stresses and strains of the weight of the Pilot , Trike and Paramotor during bumpy take-offs and landings. Your strength, health and fitness can deteriorate as we get older. When you have been flying for many years with a foot-launched Paramotor unit on your back, your spine and joints are exposed to big loads and high possibilities of compressions and damage despite years of experience. 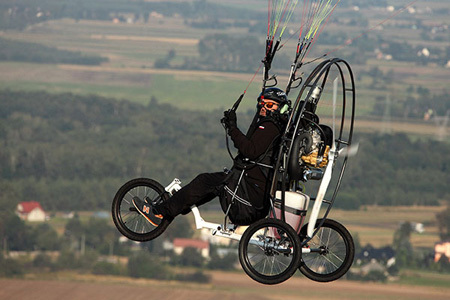 Mounting your Paramotor on a trike relieves the stresses and strains from the weight of your paramotor on your back. You can enjoy effortless flying without worrying about your body not keeping up with your age or fitness. There was no trike on the market which would let you feel like you are flying a normal PPG. 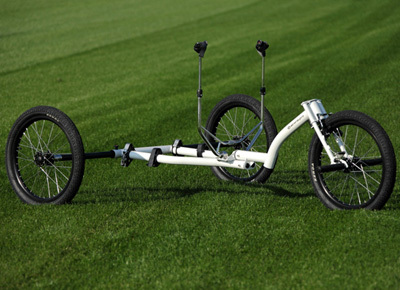 This PPG Trike allows you to use the Speed Bar-system in its full range. This PPG Trike allows you to take pictures and movies vertically downwards and around you. 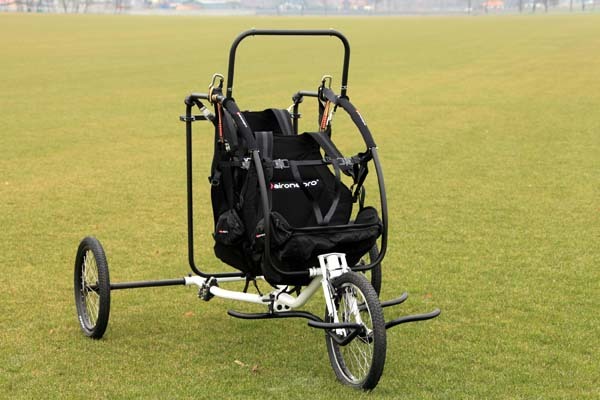 This PPG Trike allows you to attach your OWN Paramotor (with harness support systems) without any additional, custom-made suspensions struts or adaptations. Light on land and controllable when in the sky. Fast setup and packing away. Above all - Practical and allowing for the feeling and fun of flying just like a normal footlaunched Paramotor PPG. View some pictures of the Airone SOLID PPG Trike flying at the Salton Sea HERE! 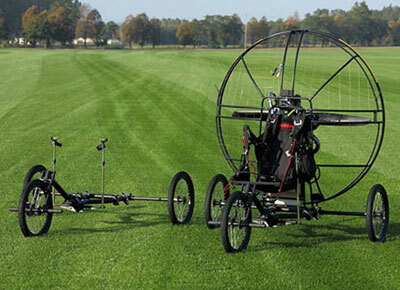 See the Airone PPG Trike coupled with the Minari Paramotor HERE! View some pictures of a custom order Skybolt Paramotor mount HERE! The AirOne Trike lightweight SOLID model has a very unique feature: you can drop the front wheel and forward chassis strut. It has a quick release designed into the construction so that you can release it in-flight. The the front wheel hangs below the trike enabling you to still use your paraglider speed bar in-flight. With a flick of your foot the front wheel comes back up and automatically locks in position for landing or if you want to just put your feet up onto the steering foot pegs for in-flight leg comfort. The Airone SOLID model weighs only 16kg. The Airone UNIQUE PPG Trike is a classic full frame. The front wheel and chassis do not fold down like the SOLID model. 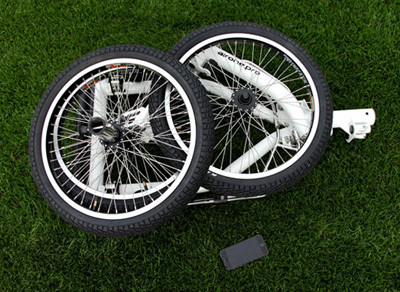 However, it does have a quick disconnect at the neck for folding the trike down quickly and easily. The UNIQUE has wider wheels, making launching from soft surfaces easier. 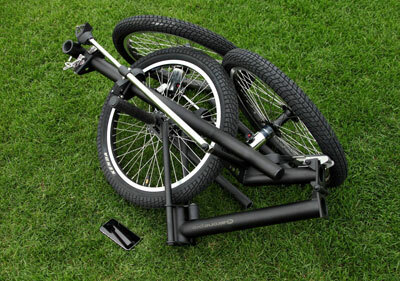 This UNIQUE model trike has extra strength and stability, yet only weighs in at 28kg. Now, There's Room for TWO!! Unique is the new light trike model, whose design allows for extending it. Thanks to that from the single trike we can construct the tandem by connecting another front with safety cage. Tandem can be also easily packed into the car. It is a very nice solution for the Tandem Rated Instructors wanting to share the magic of flight with their PPG Student Pilots. The Airone UNIQUE Tandem PPG Trike is constructed with the safety cage and anti-turnover arch. The cage is constructed in such a way to be comfortable and to be able to move easily. The cage construction protects both passenger and pilot in case the trike is toppled during takeoff or landing. The passenger harness is specially designed for this trike. It contains certified strap system that independently duplicates the normal hook-in (passenger, pilot, wing). The harness is attached to the cage in such a way that in case of trike falls over upside down it does not allow passenger to fall out from cage. The passenger position in the cage prevents them from touching their feet to the ground. This is important especially during landing, and the passenger is comfortable with their feet on special footrests. Weight of the trike ready to fly: 28kg. Does not include Paramotor.